Thank you all for your patience with me getting this post out finally. I attended the taping Saturday, July 11th, was told I couldn’t talk about it until after it aired, went on vacation back home to Chicago, and I’m just getting back into the swing of things again. I hope it was worth the wait! Before I left for the Men Tell All, I read about Amy @ the Farmer’s wife blog and her Men Tell All experience so I took a page out of her book and got there early. An hour early. We were the first ones in line. Haha. We didn’t quite make friends with the cast and crew like she did but we did talk a mother daughter pair in line who were really sweet. They went to the finale last year with Farmer Chris and said it was super crowded so they wanted to get there early to ensure they’d get in. 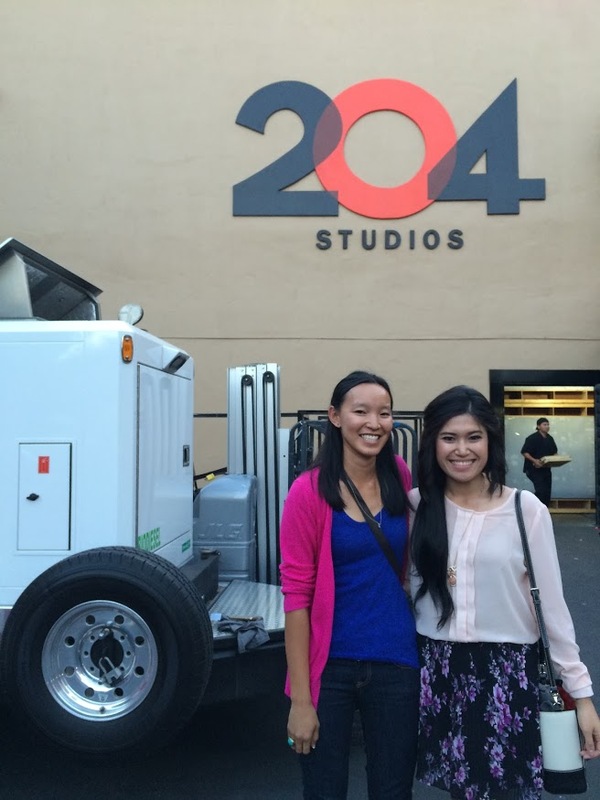 Here’s a picture of me and my friend Louise outside the studio where they filmed it. It’s totally a discrete building you’d never know they film the Men Tell All here. I’m trying to remember the timeline. So we go there at 11, people started showing up around 11:30am up until 12:45pm. We had to fill out paperwork promising we wouldn’t spill the show secrets (there wasn’t anything super juicy in my opinion) but that’s why it took me so long to write this post, on top of being out of town. They started letting people in around noon. They took our phones away, searched our purses, and we went through a metal detector. Because it is such a long day (11am-7:30pm) they kindly provided us Subway sandwiches for lunch along with chips, cookies, and drinks. It takes a little while to get everyone shuttled in and settled. We sat in that room until 3pm. They took us to the bathroom in groups which took a while because they only have a few bathrooms. It was a lot of waiting around. They were setting up and Good Morning America was there filming a segment too. Once they finally let us in, they did a roll call for seating, based on who you got tickets from. To get into this taping you have to know people involved in the show. So people who know the creator, Mike Fleiss, or the executive producers, and people who donated money to certain charities got precedence and got to go in first. Some people got to do meet and greets too, not sure with who. It was funny to me because it’s already an exclusive group to get into the taping, then once you get in there’s another level of exclusiveness. We were seated behind all the guys, but got a great view of ‘the hot seat’ Chris Harrison, Kaitlynn, and the guys that went up for interviews. Once everyone was seated, a group of girls from past seasons showed up, that are also going to be on Bachelor in Paradise. From Chris’s season Ashley S, Carly, Jade, Juelia, and Ashley I. Tenley the runner up from Jake’s season and Clare the runner up in Juan Pablo’s season (who was also on last season of Bachelor in Paradise.) Being such a fan of the show it was really cool to see so many past contestants. They’re super pretty in person. There was a warm up guy who got everyone excited and we did a few shots of audience clapping and laughing. Then we watched the first half of the show that aired Monday (when Kaitlynn let Ben H go) so we’d be all caught up. Then around 4 or so Chris Harrison came out and thanked us all for being there. Then the show finally started and all the guys came walking out at once (they wore very nice fitted suits and were very handsome and tall in person.) It was really fun to be there and having been a fan for so many years it was absolutely surreal to be sitting in the studio audience. I wouldn’t say anything scandalous happened. But the intensity with which people online attacked Kaitlynn was very surprising and appalling. I’m glad they brought attention to it and to not encourage or put up with cyber bulling. I really appreciated Ian’s apology and that he owned up to his mistakes and didn’t make excuses. I thought it was sincere. He said some things he didn’t mean and got caught up in the moment, while on the show. We all make mistakes, let’s move forward. I was sitting next to Ian’s college roommate in the audience and he said Ian was picked out at Century City mall and asked if he wanted to be on the show. I always find it interesting to hear how people get on the show, whether they’re recruited, nominated or if they apply for the show themselves. During the commercial breaks the guys would walk back and forth in and out of the studio, and chatted with one another. Since we were sitting by the guys they were walking near us so my friend I would hang out by the stairs and got Ben Z, Ben H, and Jared to wave back to us. You could tell they’re still getting used to being recognized in public. Because each guy looked a little confused when we said hi to them, you could tell they were trying to see if they knew us, then they’d wave realizing we were just fans. Hah! 🙂 Those boys better get used to it because I’m sure girls are going to be all over them in public. Also during the commercial breaks the producers and make up artists came out and did little touch ups on the guys and Kaitlynn. Because I’m a super fan (or super nerd depending on how you look at it) I follow a lot of the Bachelor producers from the show. They are all on Instagram and share awesome behind the scenes pictures through out the season, so it was cool to see them in person too. If you want to follow them here is a list of the ones I follow: Elan Gale, Megan Firestone, Lindsay Liles, Jessica Florence, Peter Scalettar, Peter G, Marco Franzitta, Jules, Lauren Spiegel, Cassie Lambert, and one of the make up artists Lisa Iverson and the show’s stylist Cary Fetman who I saw at the show. P.S. where do I go to sign up for their jobs? Looks like they’re having a blast! We were in the room with everyone from about 4pm-7:30pm. After they finished filming they let us out, gave us our phones back and had shuttles waiting to take us back to our parking garage. They also gave us Bachelorette shirts on the way out. My friend and I stayed a few minutes after they let us out and we saw Ian talking to his friend, and we introduced ourselves to Joe. I shamelessly asked him if he knew where they were going after and he said he had no idea. Haha! Can’t say I didn’t try. Then once we got dropped off at the parking garage, a girl waved us over to her car. I thought she was asking for directions, turns out she was a reporter for E News that was looking for some inside scoop from the taping! How weird and shady is that? That my friends, is how rumors start. What would that girl have reported to her boss? Two random girls from the taping told me this and that happened. Reliable sources huh? Doesn’t she know that we signed confidentiality agreements? So that was my day at the Men Tell All taping in a nut shell. A really long, lengthy, wordy nut shell 🙂 I’d be happy to answer any questions you guys have, now that you’ve all seen the episode. It was one of the coolest experiences I’ve had since moving to California and am so grateful that I was able to go and will never forget it! Linking up today with Annie and Natalie on Thoughts for Thursday and Amanda for Thinking Out Loud! Ummm that is awesome!! I’m so jealous! 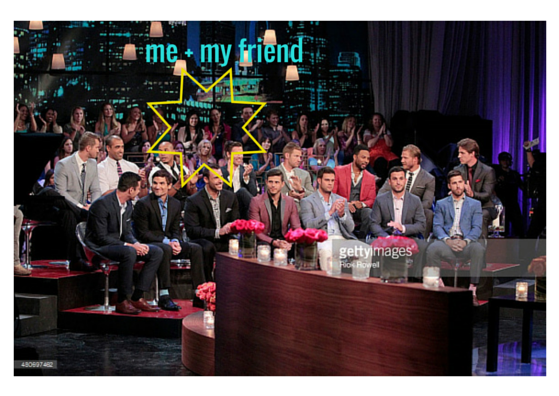 I am such a fan of the Bachelorette. Also, how cool is it that you got to meet Shay there too!? Meeting Shay was awesome! 🙂 I still can’t believe I was there. So SO cool that you got to go!! It makes it seem more real reading this and not that it’s all just fake. I feel like they are a pretty tight nit group of people. I know you’ll always remember that experience!!! Oh, this sounds great sweetie!!! Great post and lovely blog! That’s so awesome you met Shay! Sounds like a fun experience! So fun that you got to go to the taping!! It looked like a blast! How did you get tickets?! Yes it was awesome! A friend of a friend (who I met once!) who is an editor of the show requested tickets for me. It was SUCH a nice gesture! Wow I’m so jealous of all of this. I want to go someday!! How did you get so lucky to go?? Even though I went I still can’t believe I was there, it was SO cool! At a dinner party I met an editor from the show and after we talked he could tell I was a super fan (and super nerd) of the show so he secretly requested tickets for me to go! How nice is that?! I didn’t realize how tall some of those guys are, the producer girls look tiny! They’ve got a pretty sweet job, I am SO jealous! That’s so awesome! So cool you got to meet Shay and talk to one of the guys! I would love to go to a taping of something one day…I don’t even really care what it is! Ha! You should come to LA there are so many fun tv tapings and they’re free! so much fun!! What a cool experience. I’m jealous you got to meet Shay too. She’s adorable and I’m so happy she’s kept up her blog! Thanks for linking up! Yes I agree, I LOVE Shay’s blog and her sweet family! Sounds so fun! So shady about the reporter though. I know, right?! It was so weird…! How amazing that you got to go to the MTA! And you met Shay & Sheaffer?!? That’s so cool! I love that you too were excited I got to meet Shay and Sheaffer, it was AWESOME! haha they were so nice and friendly! I would have died meeting Shay in person! Haha I’m not going to lie, I was pretty star struck! But she couldn’t have been nicer! what a fun day!! way to go being first in line, that’s impressive 🙂 I had a friend who was recruited to be on one of these shows in college and I always wonder how many of the contestants actually signed up to be on the show without being discovered…so interesting to think about! I totally agree! I thought ‘being discovered/recruited’ was an old school method of finding people but I guess they still do it! Such a fun experience! I’m so glad to know that you follow some of the producers from the show…glad I’m not the only one! Haha. I love the producer pics it’s so fun to see what they’re up to! So fun!! And I really enjoyed this recap!! Thanks for the inside scoop. I can’t wait for the crazy that is bachelor in paradise to start!! !